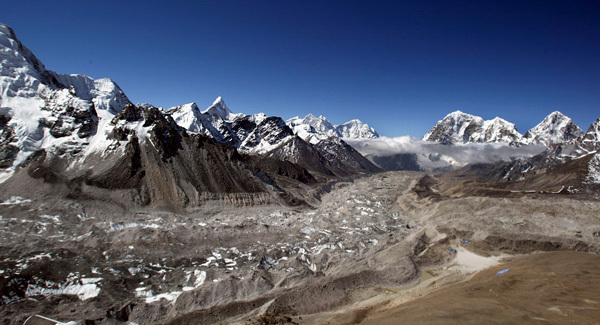 Raising an alarm against the deteriorating environmental conditions in the Tibetan plateau, the Dalai Lama said that two-thirds of the glaciers in his homeland may disappear by 2050 because of climate change. The spiritual leader also advocated that this concern needs to be addressed at the upcoming UN Climate Change Conference, COP21, which will be held in Paris from 30 November to 11 December 2015. The Dalai Lama was speaking at the climate change conference organised by the Tibetan government in exile in Dharamshala, Himachal Pradesh. The event was organised to launch the campaign- "Tibet Climate Action For The Roof Of The World", for urging the international community, including the world leaders gathering in Paris, to recognise the Tibetan Plateau's importance to the environmental health of the planet and to make Tibet central to global climate change discussions. "The Tibetan Plateau needs to be protected, not just for Tibetans but for the environmental health and sustainability of the entire world," said the Dalai Lama. The Tibetan plateau is called the Third Pole as it is the largest store of ice outside the North and South Pole and feeds Asia's six great rivers. But according to researchers, the ice-laden plateau has experienced rising temperatures of 1.3 Celsius over the past five decades which is actually three times the global average. This is because Tibet has an average altitude of over 4,000 metres (13,125 ft) which makes it particularly vulnerable to the impact of climate change. According to the data released by the Tibetan government in exile, about 80 per cent of the ice in Tibet has retreated in the past 50 years. With the rapidly melting permafrost, 12,300 million tons of carbon could be released into the air, further exacerbating the problems of global warming. Giving references of scienctific research, the Dalai Lama further said, "Tibet is as vital as the Arctic and Antarctic." Paris will see the convergence of 200 countries in December for one of the biggest climate change conferences. Meanwhile, Tibetan leaders are demanding for an effective climate change agreement and want a say in the discussions which are held at the conference.